The Swedish American Heritage Society of West Michigan, an affiliate of the Swedish Council of America, was founded to preserve, foster and perpetuate traditional customs and culture of our Swedish heritage, as well as that of other Scandinavians. If you are of Swedish heritage, or the spouse of same… or if you simply have a sincere interest in Swedish or Scandinavian heritage, you are invited to join us! Save the date for our annual gathering to greet Spring! Please make plans for your family and friends to join us for this fun-filled event, held at Hager Park in Jenison. 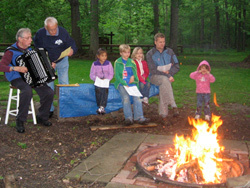 Spring is greeted with songs and bonfires at public gatherings all over Sweden. We will be celebrating with food, music, and fun activities for kids and adults. For more information, including how to register, visit the Upcoming Events page. We are happy to announce that SAHS/WM has received a grant from the Swedish Council of America to sponsor a series of three events built around Swedish Cuisine. 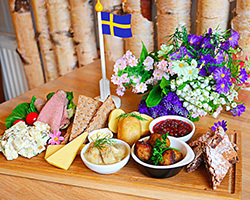 With midsommar just around the corner in June, the Ginger Chef (Jennifer Zirkle-Grawburg) will give us some ideas for Swedish recipes for picnics, and other outdoor celebrations. The class will be held at Central Reformed Church in downtown Grand Rapids. For more information, including how to register, visit the Upcoming Events page. 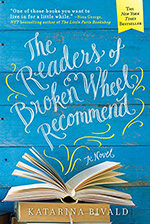 At its next meeting, the Swedish Reading Club will discuss The Readers of Broken Wheel Recommend (Läsarna i Broken Wheel rekommenderar) by Katarina Bivald. For more information, visit the Upcoming Events page. Grant & Gloria Anderson were interviewed by WOOD-TV for a segment that aired on March 9: “Technology puts WWII vet back in pilot’s seat.” Watch the segment below! Swedish American Heritage Society of West Michigan shared a post. Today in Sweden tradition has it that 'Easter witches' will fly to the Blåkulla mountains on their brooms. To celebrate this nowadays children dress up as very cute little witches and go door to door looking for treats.